I share my shop with my husband, craftsman Peter K Pestalozzi. 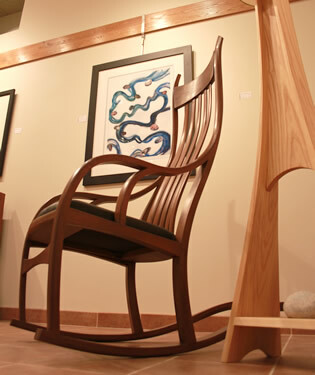 Peter designs and builds custom furniture often inspired by by his years of kayaking on Lake Superior. He's also great assistant when I'm working on canoes! Jerry Stelmok, Atkinson, Maine. Jerry builds on the original EM White Forms, my teacher, teaches at Wooden Boat, does repairs, builds w/c sailboats, paints murals on w/c canoes, writes, watercolors, draws, tells jokes … not so good at tying knots. Canvas, filler, stembands, tacks, whole kits so you can build your own canoe. Danncraft Canoes, Sunburg, MN. Builds and repairs, also teaches classes at North House Folk School. Alex Comb, Two Harbors, MN. Builder, repairs. These guys do a really great job of stripping the varnish and/or paint off that old canoe. Appleton, Wisconsin. I’ll drive 7 hours to have them strip my canoe before I’ll do it myself. Call ahead for an appointment and they can do it in 2-3 hours while you wait. Well worth the trip, and the money. Wrap your canoe for travel. (Paint takes more time and costs more.) Take the ferry across Lake Michigan and make a vacation of it. Yoke Pads, repairs gunwales, some supplies for builders, strip canoe plans, voyageur canoes for camps. Yoke Pads, gear, BWCA outfitting, used canoes,clothing, exotic adventure travel. Classes in building and repair of Wood/Canvas canoes and just about every other fun thing you could think of learning to do the old traditional way. Timber framing, baking bread, mosaics, basket weaving, sailing …on Lake Superior, very pretty…. Tripping Camp and Family Camp in Ely, MN. Ages 12 and up. Uses Wood/Canvas Canoes. Widji has a strong take care of the environment, yourself, your companions, and your equipment (ie your wood/canvas canoe) ethic… so if you send your kids there you'll be camping the 'Widji Way'. The kids do progressively harder, longer trips, ever farther North, until as High School graduates the 'Voyageurs' do a 5-6 week trip in the Arctic. This is where I got started paddling and working on canoes.